After rumors began flowing about Xiaomi's 8th anniversary flagship phone, the company itself took to Twitter to confirm that the Xiaomi Mi 8 is coming Thursday, May 31st. And yes, if you're keeping count, the company has decided to skip the seven and jump to eight, because it is its eighth anniversary. A teaser image accompanied the announcement, depicting a number eight with conductive tracks running over it, which didn't seem all that revelatory yesterday, but it does now. How? 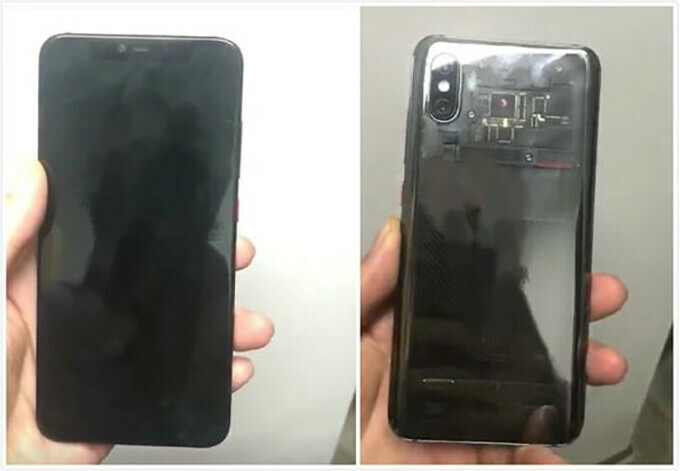 Well, an alleged live video of the Xiaomi Mi 8 showcases the phone with a translucent back — or 'clear' as it was popular in the 90s — similar to the HTC U12+. It's an interesting approach this, mixing old and new design trends, and Xiaomi may have been alluding to it in yesterday's teaser image. It also gives merit to the newly leaked video. Another interesting thing, aside from the clear back, is the notch up front. Yes, the Xiaomi Mi 8 will allegedly have an iPhone X-style notch — that is, a wider one than most other Android phones that have adopted the notch — that may actually house the cameras and sensors needed for true 3D face recognition. This has been one of the rumors floating around about the Mi 8 for some time, so a notch may really be needed in this case. As far as the bottom bezel goes, however, there's not much you can see in the leaked video. The lighting is less-than-ideal and the resolution is too low to be able to make out anything at the bottom of the screen. Even after doing some adjustments to the image, we were not able to reveal anything resembling a bezel at the bottom. Still, there could be a thicker edge there, as completely eliminating the bottom bezel can be a difficult and expensive process. Essential has cutout for selfie camera only tho...so, your point is? The idea...the idea...it all starts with the idea. Samsung make that display and Samsung got patent for notched display since 2016, way before you even heard rumor about iPhoneks notch. LG were also granted a patent for a notch in 2016. I feel the same way... I prefer the Mi Mix idea... I rarely use the front camera and when I do, It's not a big trouble to just turn your phone upside down. What an interesting and original design. Apple is just sitting back like, these copying MF’ers. That's why Apple sued Samsung a few years ago. This is ridiculous. Can't really do anything with China's disregard of copyright laws and the government's protection of local companies. They can't, because then Essential will do something about Apple. Maybe Apple didn't start the notch design but that's the one everyone is copying. If Apple didn't notch, few others would. That isn't the reason. The reason is the screen technology advanced to allow it. Previously, at scale, they had to be square/rectangle. Now you can have any shape you like. This has allowed us to have rounded edges and cut outs for cameras and so on. Everyone is heading toward a bezel-free design, but it isn't cost-effective to do yet, so the notch is the middle ground. I see I have myself a new puppy...I throw out a comment, and you fetch boy. I never said they started it, but they’re the trend setters as usual...fetch. Trend setters for what, wireless charging? water proof phone? Essential sits back and MF's Apple for the same copying. It's either Xperia or Galaxy for me now then. I don't like the notch. Or htc 12+ with no notch. Unless imported or in the grey market, HTC doesn't sell anymore here in Manila. They are copying Essential phone design, not iphone! This looks nothing like Essential. Just look at the back camera module and notch shape.